This and the following day’s shots are from the same condominium project in Vancouver, B.C., Canada. We built these retaining walls. I think we used something like 7,000 for the overall project, an immense project about 2-3 blocks in length. To the right of the privacy screen trees is the street and a slope seriously downward off to the left. Grade changes were all over this one. The pics above were taken about 8 years after the installation. Note the incredibly large blossoms of the Rhododendrons on the left. These, Azaleas and a tremendous amount of other hugely flowering Spring blooms make the Northwest a landscaper’s paradise. Now, if they could just get rid of the rain! Man,is that beautiful! It is awesome work! That is all your work? This landscaping is a work of art, an artistic one from a creative mind. Those retaining walls are very helpful to make the spot well-maintained. Thanks for sharing what you created and performed spontaneously. Have a good one! State-of-the -art landscaping works like this has a stunning beauty. It shows the spacious garden and highlights the cool ambiance. 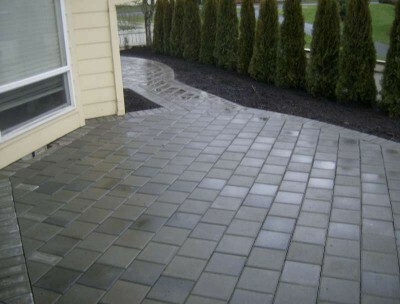 The owner will surely love and enjoy your landscaping masterpiece. Thanks again for such fulsome praise, Paul. As you probably know, I loved the work.